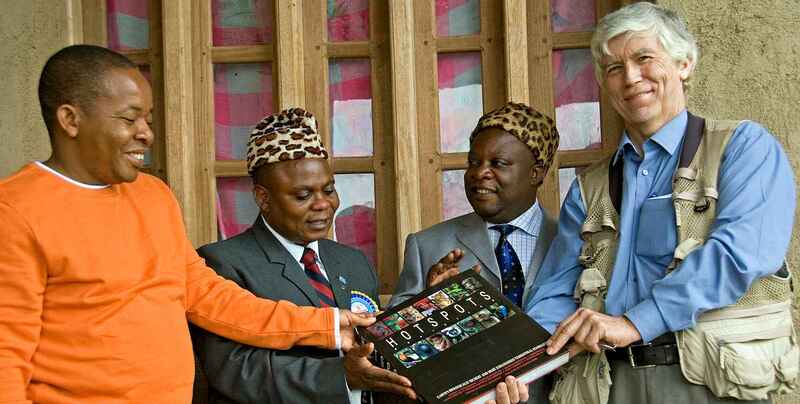 Russ Mittermeier hands a copy of "Hotspots Revisited" to officials in the Democratic Republic of Congo. Russ Mittermeier, the chief conservation officer for CEPF grantee Global Wildlife Conservation and chair of the International Union for the Conservation of Nature (IUCN) Species Survival Commission’s Primate Specialist Group, is a renowned veteran conservationist recently honored with the 2018 Indianapolis Prize for animal conservation. The former president of Conservation International pioneered the use of global biodiversity hotspots for strategic conservation, setting the stage for the Critical Ecosystem Partnership Fund and others who have embraced the hotspots concept. Mittermeier recently answered questions on some topics near and dear to CEPF’s heart. Question: What is biodiversity and why is it important? That wealth of genes, species, ecosystems and ecological processes that make our living planet what it is—still the only place in the entire universe where we know with certainty that life exists. The sum total of all life on Earth. Our living legacy to future generations. The most basic underpinning of long-term sustainable development and human well-being. We should do everything to conserve it in its full glory. Q: You have shared the story about how you wanted to be Tarzan when you were a kid—a dream a lot of kids shared with you. How did you get from there to dedicating your professional life to species and conservation? A: I am sure that many kids of my generation and others were inspired by Tarzan (including also my two sons). But I took it really seriously starting at 6, and planned from very early on to get out into the jungles of the world. When my mother enrolled me for first grade in Catholic school in the Bronx [in New York City], the mother superior asked me what my name was. I answered, “Tarzan.” She said that they couldn’t call me that, at which point I told her that if they didn’t call me Tarzan, I would not go to their lousy school. My mother resolved that issue and they did accept me. A few months later they asked me what I wanted to be and I answered, “jungle explorer.” Nothing has really changed since then. From that time on, I spent a lot of time in zoos and museums, and made my first trip to the tropics at 17. I carried out my first tropical field study at 20 (howler monkeys in Panama). Q: When and how were you first exposed to the idea of biodiversity hotspots? Was it immediately clear to you that this could be the foundation for strategic conservation action? A: I first became aware of the hotspots concept as soon as Norman Myers published it in 1988, in that first paper where he recognized 10 hotspots. In fact we had already done a similar analysis for Latin America through WWF in 1983, but didn’t use the term (although we selected pretty much the same areas), and I had come up with the megadiversity country concept in 1986, which was a similar diversity- and endemism-based priority-setting mechanism. As soon as I saw the Myers hotspots paper I recognized that it could be a powerful tool, but also saw that some areas were missing. I and several others contacted Norman and he published an updated paper in 1990, raising the number to 18. CI adopted the concept for the next 20 years. At CI, we revised the concept several times and published many papers on it. In our 1999 book we raised the number to 25 (the same book that led to the creation of CEPF), and in the 2004 book it went up to 34. A few more have since been added, so we are now at 36. Q: Do you think the biodiversity hotspots concept remains a good tool for prioritizing conservation? A: There is absolutely no doubt that hotspots are still the best overarching strategy for ensuring that the full range of terrestrial biodiversity is maintained. Taken with the site-specific Key Biodiversity Area (KBA) and Alliance for Zero Extinction (AZE) concepts, we can easily target the world’s most important and most threatened areas for terrestrial biodiversity (and most of fresh water). And now Global Wildlife Conservation has adopted the hotspots as its overarching strategy as well. Q: You have worked closely with indigenous peoples in your conservation career. What is your view of their role in protecting nature? A: Those of us who have worked on the ground for decades have always recognized the fundamentally important role of indigenous people. Fortunately, over the past 15 to 20 years, the international community has started to recognize this as well. If you look at protection of natural areas, we currently have about 15 percent of the land surface of the planet in traditional protected areas of various kinds. But only recently have we started to understand that we already have 12 to 13 percent protected in indigenous and community-owned conservation areas, and a lot of the growth in “protected areas,” especially in places like Amazonia, is going to be in such indigenous lands. Are they perfect? No. But then a lot of the traditional protected areas have their problems as well. Q: More broadly, what is your view of the role of civil society in conservation? A: More than any other sector, biodiversity is heavily dependent on civil society, and especially on small local NGOs, community organizations and indigenous associations working on the front lines of conservation. That is where the real action occurs and the only place where there is any continuity, especially given the increasing volatility and fickleness of governments. And small-grant mechanisms are the way to go in biodiversity, rapid-action delivery of the resources needed (and at a level consistent with the absorptive capacity of the organizations involved), with minimal bureaucracy and a strong focus on urgency. In the past, dumping of millions of dollars on biodiversity conservation has usually created at least as many problems as it has resolved. Q: What message would you want to give to CEPF’s grantees, who are working to protect the biodiversity hotspots? A: You are doing what might well be the most important work in the world, without which we will lose many of the wonderful species and ecosystems that make our living planet such a special place. We greatly respect and admire your dedication and commitment to your work, which is often quite difficult, and we stand ready to help you in a way that we can. Macaya breast-spot landfrog (Eleutherodactylus thorectes), Haiti, in Caribbean Islands Biodiversity Hotspot.